Disclaimer: I did receive free product in exchange for this review. This did not have any influence on my review. These opinions are my own. 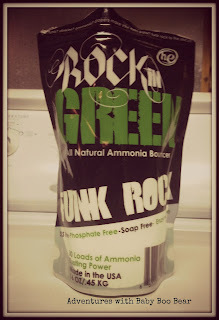 I have been using Rockin' Green Laundry Detergent since we started using CD. I spent a lot of time looking into detergent because A) we have very hard water and B) I was terrified of messing up my washing routine! I had read so many horror stories of people ruining their entire stash because of the wrong detergent. I have had ZERO problems so I figure why mess with perfection? The Rockin' Green love doesn't stop there for us. We also use Shake It Up! in our wet bags. I LOVE this stuff. As I've posted previously we leave our wet bags open, hanging on Emmett's dresser. I have had no problems with smells. 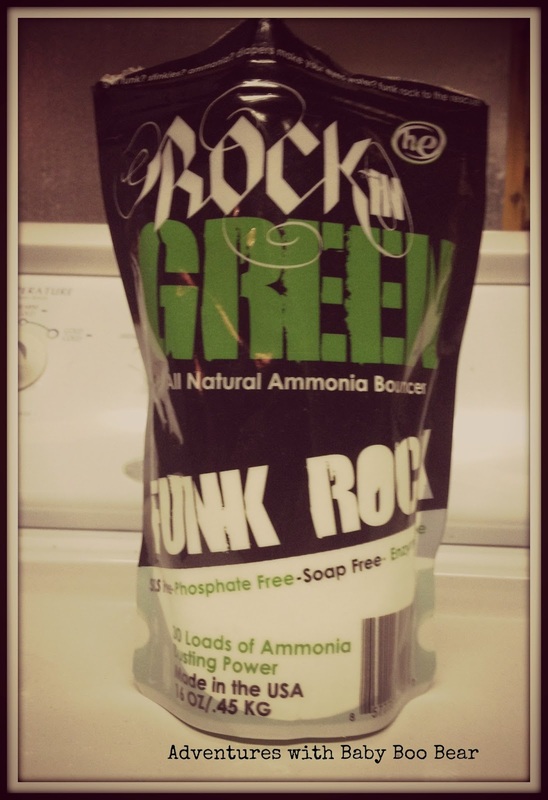 I was so excited when the awesome folks over at Rockin' Green sent me a bag of Funk Rock Ammonia Bouncer to try out! What is Funk Rock (Information is the content of rockingreensoap.com)? Do you have the funk? Stinkies? Ammonia problems? Diapers that make your eyes water? Have you considered a kryptonite lined diaper pail to contain the smell of your dirty diapers? Did fluffy or fido have an accident on your bunny slippers? Dealing with the dreaded toddler pee? You need funk rock! This 100% natural compound is unlike anything you have tried before. It targets funk at the source and leaves no prisoners. Just 4 tablespoons is enough to de-funk up to 20 diapers in one sitting. A little to your pre-wash to keep the stinkies from coming back. That’s right, this 16 ounce bag will keep the diaper funk away for over two months! Conveniently (well sort of) Emmett ended up with a wicked diaper rash last week and we needed super strength cream that I just don't trust on my CD so we switched to disposables for a few days while it cleared up. I accidentally forgot about the bag of stinkers....for FIVE days. Ahhhh CRAP!! Literally! It was time to put Funk Rock to the test! I followed the directions on the package. Put 4 tablespoons into warm or hot water and add your diapers. You are lucky smell-o-vision does not exist. My eyes were watering the ammonia on these guys was so bad. 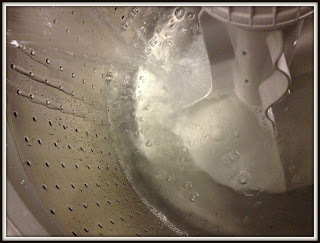 I knew well enough to take a big breath and just dump those dipes into the wash. I could smell the barnyard from 4 feet away! I let it soak for 60 minutes and then washed as usual. My final verdict? A God send! 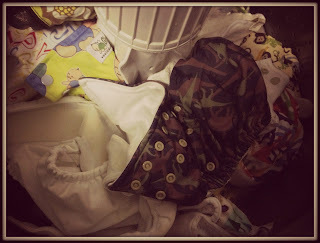 You would never know that these diapers were the same ones I threw into the washing machine! I also threw in 3 diapers that were waiting to be stripped because the build up and barnyard smell on them was so bad. They also smell brand new! I did the ultimate sniff test on the biggest offenders of the bunch...I know who they were because there are still some stains on them - nothing a little sun bleaching won't take care of! Watermelon fresh (not from the Funk Rock, we use the watermelon scented RG detergent). Funk Rock receives hands down 5 Stars from this family. We may never have to strip our diapers again! Thanks Rockin Green! Funk Rock is the best! I did an overnight soak with it to start, but now all I have to do is add a little to occasional loads, along with the soap. No more ammonia funkiness in my household! Tushie Talk Tuesdays: What's in our stash? All material in this blog is owned by Adventures with Baby Boo Bear and its writers. Powered by Blogger.